Despite winter weather conditions, students and community members alike gathered in Sauder Concert Hall on Saturday night, Jan. 22, for a concert combining Chicago based La Caccina, the Goshen Women’s World Music Choir and local choir, Notable Women. 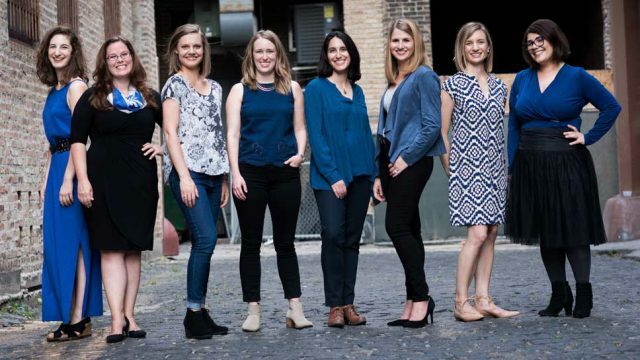 La Caccina is a professional women’s vocal ensemble and nonprofit organization known for its wide range of musical styles. The group was formed in 2011 by three friends and has since grown to include eight members. The concert was also a homecoming for one of the members of the choir, Rachel Mast, a 2014 Goshen College graduate who studied music. Saturday morning before the concert La Caccina held a workshop with the Women’s World Music Choir in preparation for the concert. The visiting ensemble also held a class Saturday afternoon for voice students. Throughout the day, music students learned valuable skills about their music and tips about networking and making careers in music. Because La Caccina and Women’s World Music Choir are both treble choirs, La Caccina also taught them about improving and working together as a treble choir to have a more cohesive sound. During the concert, Carling Fitzsimmons, La Caccina’s artistic director, said that it was an enriching experience for both choirs to get to work together and learn from each other. Each choir sang selections from their individual repertoires, and the concert also featured combined pieces. Two of the three songs that the three choirs performed together, “Woodsmoke and Oranges” and “Miniwaka or The Moments of Water,” were learned that morning in the workshop. “Miniwaka” was an audience favorite. In the piece written by R. Murray Schaufer, a pioneer of sound scapes, the three choirs combined their voices to create various harmonies mimicking different water sounds. On the anniversary of the Women’s March, a notable part of the concert was the prevalence of feminist themes in the music sung. The Notable Women choir sang “Never One Thing” by May Erlewine, which is about the complex roles that women play in society and the power they hold. The combined choirs sang “Ella’s Song,” the words of which were first written by Ella Baker, an activist for equal rights who wanted to uplift young people. The repeating line of the song, “We who believe in freedom cannot rest until it comes,” shows the meaning of the song. The concert also coincided with Martin Luther King Jr. Day, giving the song an extra meaning as Ella Baker is primarily known for her involvement in the Civil Rights Movement. La Caccina showcased a variety of treble sounds and song styles in their lineup, ranging from humorous modern pieces such as “National Weather Forecast,” which was originally commissioned by the San Francisco Girls Chorus and praises the sunny weather of California, to more traditional choral arrangements. The GC choirs will next take the Sauder stage on Feb. 9 for their Winter Choral Concert.